VibraHone ™ Vibratory Bowls and High-Energy Mass Vibratory Finishing Machines provide high-energy, high-amplitude finishing, polishing, preplating and deburring and can utilize the full spectrum of Vibra Finish media. The CB-30 Centrifugal Barrel Finisher offers "High Energy" Precision Deburring and Polishing with a wide range of speeds, ease of operation, extremely low noise levels and small footprint. All in an attractive machine enclosure. The Centrifugal Barrels operation involves 4 Barrels on an independent axis driven by a planetary belt drive system. 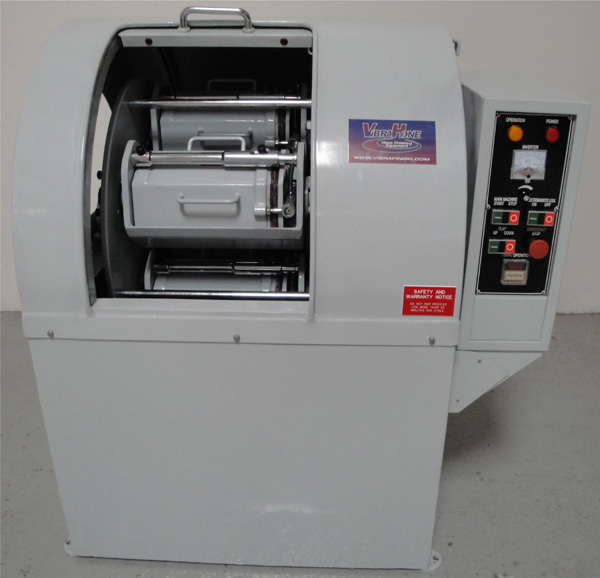 Heavy duty steel plate machine with front sliding door is equipped with a magnetic safety lock for safe operation. Heavy duty spring loaded safety bar holds each barrel in the cradle with 2 locking bolts. This innovative safety feature of the spring loaded tension bar holds the barrel in the cradle even if the locking bolts are not secured. Barrels and lids are hot poured with 10 mm thick polyurethane. The cam lock lid is designed for ease of operation. Adjustable eye bolts keep the lid tight from ever leaking. The motor base is mounted on an adjustable bolt and can be moved up or down to adjust the tightness of the motor belt. The rotary barrel plate assembly is composed of: belt assembly, chief axis gear and chain assembly. CAPACITY OF MACHINERY 1.0 cu. ft. 2.0 cu. ft. 3.3 cu. ft.